I wake with a pit in my stomach. I wish I could yank up my quilts and hide from the day, but the morning doesn't know how to mourn. The dead cannot defend themselves. I've never been Aunt Clara's ideal specimen of niece, with my flat feet and too curly black hair and wide lipped laugh - though there's been no reason for laughter these past months, and certainly not this morning. Picture the Dead is more than a ghost story. It's a truly masterful, original, and jaw-dropping creation - a work of art. There's a touch of romance, beautifully described historical setting, goose-bumpy atmosphere, and a thrilling mystery. Above all, there's a skillfully executed, bone-chilling plot line, emotionally engaging first-person narrative, and a totally unexpected yet entirely satisfying conclusion. 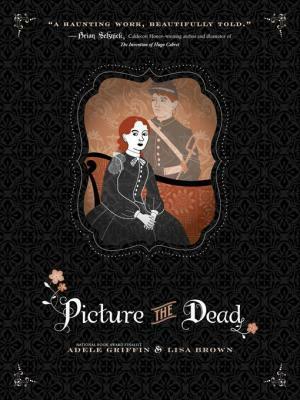 Combining Adele Griffin's excellent writing style with Lisa Brown's phenomenal illustrations, Picture the Dead reaches a whole new level of storytelling, taking the reader back in time to the last months of American Civil War. The deliciously eerie scrapbook-like graphics perfectly complement the plot line, adding flavor and resulting in an unforgettable reading experience. Be prepared, this book will haunt you long after you turn the last page. In this riveting book, set in 19th-century America (1864-65 - the last two years of American Civil War), we meet sixteen-year old Jennie Lovell, who, after both her parents died and her twin brother was killed on the battlefield, was taken in by her Aunt and Uncle - the parents of her childhood friend and soon-to-be-married fiance, William. Jennie doesn't have anyone left. She has no other family members to turn to, nor does she have any savings of her own. She's fully dependent on her fiance's family, and when the news about Will's death reach the Pritchett household, Jennie finds herself in a very difficult living situation. Aunt Clara becomes even more hostile towards her, making it clear that Jennie does not belong there. With no status and nowhere else to go, she tries desperately to prove herself useful to her Aunt and Uncle by performing various household tasks. She's also caring for Will's brother, Quinn, who returned home seriously injured. Moody and withdrawn, Quinn refuses to speak about his war experiences, nor does he want to talk about Will and what happened to him. It quickly becomes obvious that he knows more than he lets on. There's an air of mystery surrounding Will's passing, and Jennie is determined to find the truth. Even if it means doing something unconventional, like, say, trusting in the supernatural and looking beyond the rational to seek answers to her fiance's death. What she uncovers is so much worse than she ever expected. In this enthralling wonder of a book, Adele Griffin and Lisa Brown managed to create a truly breath-taking and spine-tingling atmosphere, without the book becoming overly creepy or frightening. Is it scary? Oh yes, it is, but in a very subtle and balanced way. Mystery and supernatural play a big role in this novel, and the delicious Gothic illustrations blend well with the story, enhancing the already powerful, eerie atmosphere. The amount of thought put into this project is really admirable. Down to the last detail, everything is well thought-out and executed with care: all the mesmerizing drawings, choice of colors, even the font type. With rich descriptions and accurate language for the time period, Adele Griffin does an excellent job painting a vivid and realistic historical background, and breathing life into the characters. The landscapes, the city and the Pritchett House are all very well drawn, the dialogues come across as natural and believable, the scrapbook elements add intensity and flavor to the story, the pacing is excellent and, in the end, it all comes together in a way that is nothing short of brilliant. Plus, we get a look at the social/class issues of the period. Not only do we see the suffering of the families affected by the Civil War, but we're also introduced to a fascinating phenomenon of 19th-century Spiritualism - a significant social movement, that was especially popular during the war, when so many lives have been lost, and people would do anything to contact their loved ones one last time. All in all, this was a very unique and enriching reading experience and one that I won't forget for a long time. If ever. Picture the Dead is a haunting and painfully beautiful tale of love, betrayal, trust, hope, perseverance, death and new beginnings. Extremely well-written and gorgeously illustrated, it's a fabulous ghost mystery. Highly recommended! Sourcebooks Fire generously offered a copy of Picture the Dead up for grabs! The book sounds great! I am usually not a fan of books in the Civil War era, but I'm very interested in seeing what happens to Jennie now. Thanks for the giveaway! Wow, this book sounds awesome! I haven't heard of it before, but it's definitely on my radar now. YA historical fiction, illustrated, mixed with creepy? Um, yes please! Thanks so much for the giveaway! I love that the book has illustrations - honestly, I think there should be more illustrated YA and adult books. Just because we are supposed to be grown up doesn't mean we don't like pictures! OH WOW. So many things jump out at me about this. 1. First of all, I wasn't aware of this book, so thank you for bringing it to my attention. I LOVE THE AMERICAN CIVIL WAR ERA and all thing associated with it - enjoyed learning about it in school and love reading about it now. So this seems right up my alley - plus illustrations. THAT alone was enough. 2. This quote: "...I wish I could yank up my quilts and hide from the day, but the morning doesn't know how to mourn." ---> For some reason, I just love it. It's another reason I'd pick up the book. It strikes me in just the right way. 3. "delicious Gothic illustrations" --> yes, please! 4. I always love reading about social class issues too. This book just screams Asheley, up and down. Evie, thank you for another addition to my TBR and another brilliant write-up of your thoughts! I don't think I have read a YA Historical Romance book before. This book sounds extremely interesting. Thanks for the giveaway and introducing me to a new book. I'm always up for a different kind of story. This sounds very interesting. I would love to read this book! After reading your review, it seems my type of book :) Thanks for the giveaway! This has all the elements that I love in a book: historical setting, mystery, a ghost story... I'm sold! Thanks for the review. This book has been on my to-read list ever since I met Adele at a book festival last year--would love to win a copy! Thanks for the awesome giveaway. I've seen this book around a lot lately. Books about ghosts totally interest me. There are so many elements to the story that I like including the era, the mystery and the paranormal. I'm glad to hear details are well-though out and given because with so much elements it's important. Thanks for the review and giveaway! This looks like such a fascinating read - war and spiritualism and ghosts, oh my! "There's an air of mystery surrounding Will's passing..." ---okay, that part of your review is when my ears shot up and I told myself: "Gotta read this book." Mmm...the title is a litte daunting, but I appreciate that you explained in your review that the fear evoked is subtle. I can't tolerate all-out horror! It freaks me out! Crossing my fingers for this one. wow, it souds like an interesting historical novel!! Aah! This looks so amazing! I'm loving the cover AND I'm a big civil war geek so this is right up my alley. Can't wait to read it! This sounds like a really intriguing historical with a supernatural twist. It is great to see some more history and American at that creeping into YA, I cannot wait to read this one. Thank you for bringing it o my attention. I love historical fiction books, especially about the 19th century. And the mystery/supernatural aspects sound intriguing as well. After reading your review, I'm very curious what happened to Will and what will happen to Jennie! This book sounds great. I love to read books of the civil war era. The review was awesome and would love to know what happens with Jennie. Sounds good, will have to get a copy! This book looks interesting and I would love to get a chance to read it. Thanks for the chance at a great giveaway. Great review! It sounds awesome. I really want to have it now. I love how it sounds and I bet the illustrations are amazing. First I must say that I adore covers like this one. I am not sure why, but if I see covers like this my interest is immediately piqued. The book itself actually sounds like a great read, and after your review I think I would be a crazy person not to get this book in my hands as soon as I have some time. Thanks for this review!